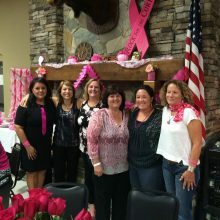 The Placer Breast Cancer Foundation is dedicated to fighting cancer through education, the funding of research opportunities, and local community outreach. We are grateful to our many local organizations and individuals who donate to the cause. We are proud that the funds we raise stay in our local community! With your support we will be able to help defeat breast cancer. Attend an educational or fundraising event (or host one at your organization) – if you would like to be added to our newsletter so you can hear about upcoming events and read more information about breast cancer research and education, please fill out the form on the right of the screen. If you would like to host an event, please email info@wethinkpink.org! We are always open to new ideas in our fight against breast cancer! Make a personal donation – You can make a one-time donation or an on-going monthly donation to the Placer Breast Cancer Foundation. If you would like to learn more about donations, you can email us at info@wethinkpink.org or click here to donate today. Your organization can become a corporate or event sponsor – If your organization would like to partner with the Foundation please email us at info@wethinkpink.org or review our 2018 PBCF Corporate Giving Opportunities. There are many different levels of support and one of them could work for you. If you would like to sponsor an individual event, that’s possible too! Check out our Events page for one that may be a good fit. Planned Giving – The Placer Breast Cancer Foundation would be honored to be considered as a part of your estate planning. For more information about how to include the Foundation as a part of your estate, please email info@wethinkpink.org. We do recommend that you also work with your personal, qualified legal, tax, and financial advisor to develop your plan. The Placer Breast Cancer Foundation is a 501(c)3, tax ID #27-0690037. For more information about the Foundation, please download our PBCF Fact Sheet 2018.